Songmasters’ Listen To Me platform produces year-long multi-media celebrations of the True. Great. Original. recording artists who forever changed modern music and culture. Each campaign feature today’s leading and emerging artists paying tribute to their musical forebears to raise support and awareness for the next generation of songwriters, performers, and music entrepreneurs. Buddy Holly was the focus of this inaugural year of the series. Two TELLY Awards were awarded for video productions related to Verve Forecast and Songmasters’ release “Listen To Me: Buddy Holly” which received wide acclaim from the likes of Rolling Stone, Billboard and more, achieving #3 rank on Amazon after its release. Executive Produced by Songmasters and the GRAMMY® Award-winning Peter Asher, top artists from three generations recorded modern, authentic versions of the best of Buddy Holly songs. Rock legends such as Ringo Starr, Brian Wilson, Jeff Lynne, Stevie Nicks and Jackson Browne were joined by contemporary artists The Fray, Zooey Deschanel, Patrick Stump, Cobra Starship, Imelda May, Natalie Merchant, Pat Monahan (of Train) and Chris Isaak. The one and only Eric Idle, of Monty Python fame, also contributed a track. These two TELLY-Award winning productions feature these artists performing their album tracks and in interviews. Songmasters also won a SILVER TELLY Award for its production of Buddy Holly: Listen To Me – The Ultimate Buddy Party, a tribute celebration for Holly’s 75h birthday recorded live on September 7, 2011 at The Music Box in Hollywood. This celebration, recorded for PBS, premiered in December 2011 and its first encore presentation airs on PBS throughout June 2012. The Ultimate Buddy Party featured outstanding performances – which Rolling Stone declared “Rock History!” – including Stevie Nicks, Graham Nash, Lyle Lovett, Cobra Starship’s Gabe Saporta and Victoria Asher, Patrick Stump, Raul Malo, Chris Isaak, Michelle Branch, Boz Scaggs, Shawn Colvin, and Paul Anka. A special, rare performance of the one and only Phil Everly, Holly’s personal friend, was also captured in the rousing all-star finale. Listen To Me also provides support for emerging talent by boosting and empowering new artists through support for numerous music-related organizations – including the Songwriters Hall of Fame, the GRAMMY Foundation’s GRAMMY Camps® and Artists’ House Music – each of which support the artistic growth and professional development of young musicians and industry innovators. On June 17th, Songmasters presented its third annual Holly Prize, which it endows through the Songwriters Hall of Fame to recognize an outstanding young all-in-one singer/songwriter/musician. This year’s winner is EMILY KING. Recently completing the Euro-tour with Maroon 5 as their opener, GRAMMY-nominated King has also toured with John Legend, Floetry and opened for artists such as Nas, Alicia Keys, Chaka Khan and Erykah Badu. Completing an amazing trifecta this week, Songmasters proudly announces the auction of the one and only “Listen To Me” Holly Guitar, a handcrafted work of art and a superb musical instrument that exactly replicates Holly’s famed J-45 and his personally hand-tooled leather case. Viewable and biddable online at www.julienslive.com from June 18-22, this singular instrument goes on live auction on Sunday afternoon, June 24 in LA at the renowned Julien’s “Music Icons” auction. Made possible through Songmasters’ Listen To Me project in collaboration with the Buddy Holly Guitar Foundation, all proceeds from the auction will benefit the scholarship programs of the GRAMMY Foundation’s GRAMMY Camps®. 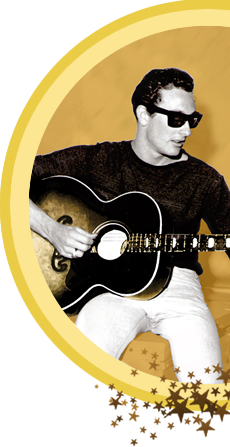 Buddy Holly, the true, great, and original recording artist featured in Listen To Me programs this year, continues to be an essential component of rock ‘n’ roll’s historical catalog as seen from Universal Music Enterprises (UME) continuous sales of its Buddy Holly: Millennium Collection, which is the No. 1 seller of the Holly catalog. More than fifty years later, new fans continue to discover the genius of Holly and his accolades continue to grow through projects such as Listen To Me: Buddy Holly.